Enjoy this Risallamande recipe. It has a lovely story. Substitute coconut cream and any kind of nut milk if you like. Hiking with REI in December the young guide, Pokey, was away from his family for the first time over Christmas. When I asked him what he missed it was Risallamande. (Rice with Almonds and Cherry Sauce). The chef at the Inn (www.hotelborealis.is) where we stayed lovingly made it for him on Christmas night. His family usually has a huge portion for Christmas Eve dinner and then has the rest for dessert on Christmas. Place rice, salt, sugar, and scrapings from vanilla bean and the bean in a saucepan. Add 2 cups of the milk and bring to a low simmer. DO NOT BOIL fully or the milk will scald. The trick here is to stir every 3 minutes or so to be sure it’s not sticking to the bottom. Add the additional milk as the rice absorbs the first liquids. Cook for about 35 minutes, Remove vanilla bean hull. Add butter and vanilla. Place plastic wrap directly over the top of the pudding and let cool to room temperature. The plastic wrap keeps a “skin” from forming on the top. (You can put in a shallow container to do this if you wish to cool faster.) This can be made up to a day ahead and refrigerated. While you stir the rice pudding, make the sauce. In small saucepan, place all ingredients (2 T of the water) except cornstarch and extract. Bring to simmer. In a small bowl, mix the cornstarch with 2 T water. Add to saucepan and stir to thicken and cook through. remove from heat; add almond extract. Serve barely warm over pudding. Place almonds in ceramic bowl; cover with boiling water. Let sit 1 minute., Pour off water and recover with boiling water. Let sit 1 minute. Run cool water over and pop off the almond skins. (You can buy blanched almonds if you like.) Coarsely chop the almonds and set aside. 2 T confectioners Sugar – I skip this added sugar but you might want to add according to the rice pudding sweetness and your own taste preference. Whip cream until firm peaks form. Fold whipped cream into cool rice pudding. I literally take the rice pudding in my hands and break it into smaller chunks so the whipped cream stays fluffier as you fold it in. Traditionally the almonds are stirred into the pudding and one whole almond is included. Whomever gets the whole almond wins…you know that Christmas/King Cake/3 Kings Cake/Hide It tradition. 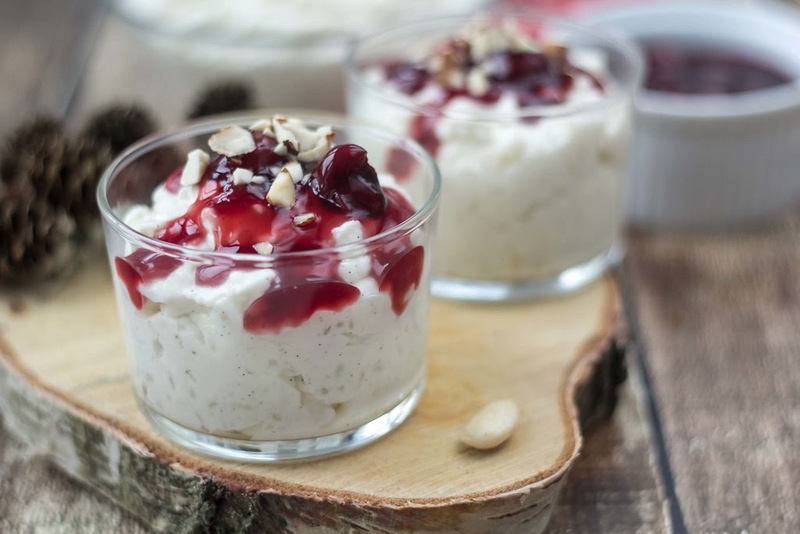 I like to place the pudding in a dish, top with cherry sauce and then add almonds on top according to my guests’ preference for nuts or not. So pretty! It’s lovely in tiny little single Asian spoons or crystal shot glasses. It will be a new holiday tradition – and well maybe a weekly tradition — at our home! Oh and Iceland is SOOOO worth a visit. Iceland Air offers free stopovers on the way to Europe.